As festive cheer starts to make us all feel rather Christmassy, the University of Warwick will celebrate the season with a host of events, beginning with a Christmas Light switch on and Christmas Market on Wed 29 Nov as well as a series of performances and activities continuing throughout December. It just wouldn’t be Christmas without a good dose of festive feeding and on Wed 29 Nov, central campus will come to life with the sights, sounds and smells of Christmas when the festive market heads our way. With a variety of food stalls as well as chocolate and gift outlets, the Warwick Retail market is the perfect place to get into the Christmas Spirit and purchase some presents for family and friends. 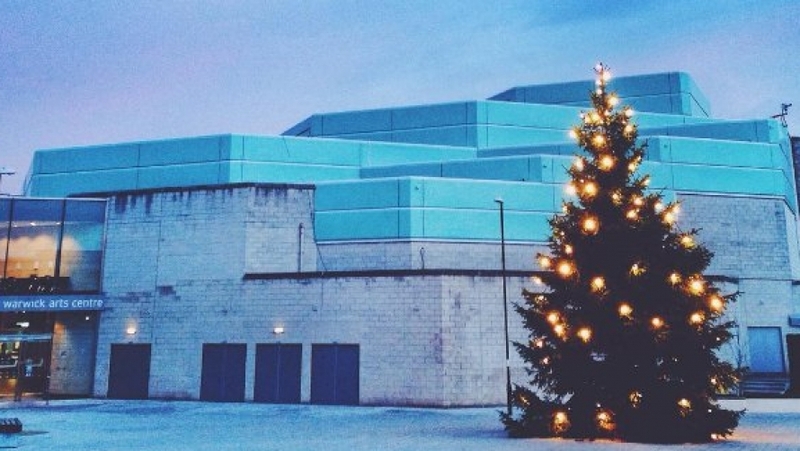 At 1pm we will light up our Christmas tree on the Warwick Arts Centre Plaza (outside the Bookshop). Accompanying the lights, as part of Creative Warwick, we’ll have a number of Warwick Student Societies performing. EQHO (HipHop Dance), MTW (Music Theatre Warwick), Warwick Belly Dance and Warwick Tap will be delighting the crowds with some festive themed mini-shows from 1pm until 2pm. To celebrate a new partnership with The Sunday Times/Peters Fraser + Dunlop Young Writer of the Year Award, the University of Warwick is hosting the freeflow Festival on Wed 29 Nov. A day packed full of events across campus, the freeflow Festival will feature some of the best names from the literary world including Owen Sheers, Sarah Moss, Natalie Haynes, and Jess Green to share and celebrate what’s fresh, controversial and relevant today. In addition, straight from the Glastonbury stage and a five star run at the Edinburgh Fringe, the poets, rappers, musicians and storytellers – Tongue Fu – will perform at The Assembly in Leamington Spa. Direct from a smash-hit West End season and international tour, We’re Going on a Bear Hunt opens in The Goose Nest from Thu 30 2017 until Sun 7 Jan 2018. An intrepid family and their musical dog will take you on an incredible quest filled with catchy songs and interactive scenes. The stage adaptation of Michael Rosen’s award-winning book is brought vividly and noisily to the stage by Sally Cookson and accompanied by Benji Bower’s versatile lively score. For the very little ones, we have the enchanting winter’s tale of Snow Mouse, which is running for the whole of December 2017. This heart-warming story about two new friends’ adventures in a magical forest wonderland is the perfect first theatre experience, full of play, puppetry and music. All film lovers can follow the adventures of the nation’s favourite bear in Paddington 2, which will be screened in our cinema for a special run on assorted dates throughout November and December. And if you want more from your visit throughout December, why not take part in our Stamp It activities? Our Creative Learning team have put together a host of exciting, free activities for all ages. Take a look at a microscopic Bear Hunt with help from the Life Sciences team at The University of Warwick, come and meet Snow Mouse or go on an actual Bear Hunt around our Sculpture Trail. Children are given a Stamp It Book to collect stamps for each workshop. When completed, they can be exchanged for 20% off on one child ticket for our Christmas shows. For more information, and to book tickets for freeflow Festival please click here where a full programme of events is listed. For more information on the Christmas shows please visit Warwick Arts Centre.